Before Ibiza's summer season takes off, Zero Gravity invites the white isle's most familiar faces to fly over and play at the poolside in what promises to an unforgettable day to night party . Be there! 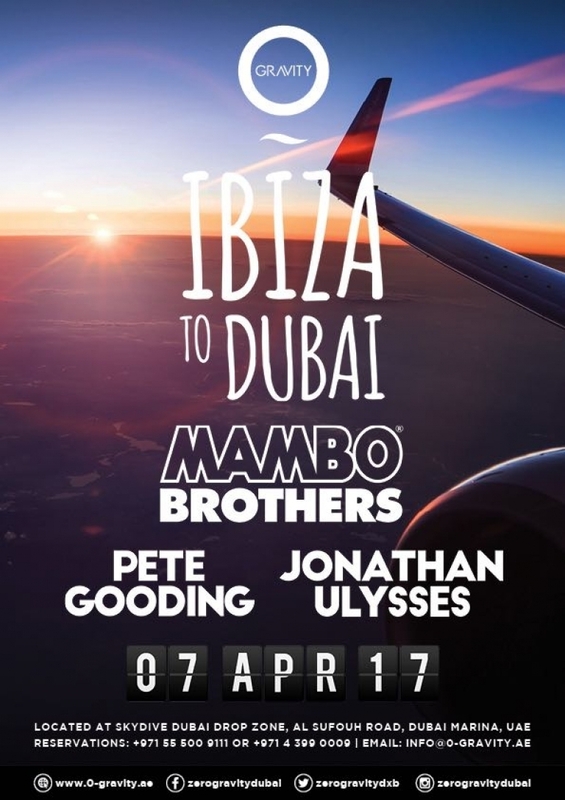 Born and raised in Ibiza, the Mambo Brother's music style heavily influenced by you - Been DJs Roger Sanchez: Such as Pete Tong, Masters at Work , Jason Bye and more recently Jamie Jones, Kölsch, Luciano and MK, which makes them bring out a broad mixture of vocally tech house with a touch of trendy house tracks from Ibiza throughout the times. Groundbreaking and bursting with innovation, DJ and producer Jonathan Ulysses has a fascinating and diverse career that spans the 20-year period, including over a decade as a resident DJ at Space Ibiza. He's knows how to fill the biggest dancefloors in the world. Pete Gooding is a club DJ, music producer and radio presenter, but way beyond any name or title he's a music fan. Thanks to his broad musical taste, musical knowledge and boundless energy, he's one of the lucky few who have managed to turn what I love into what I do. Pete does music full time, full on, all the time.